Nothing represents Fall more than cool weather, autumn leaves, and pumpkins. To celebrate the lovely autumn weather we decided to compile a list of some tasty treats that you are sure to love . Pre-heat oven to 350 degrees. Line a 9x9 pan with aluminum foil and then spray with nonstick cooking spray. In a medium sized bowl mix together flour and brown sugar. Combine mixture with butter until crumbly then stir in the pecans. Pack the mixture into the bottom of the pan and bake for 15 minutes or until the edges are light brown. Let crust cool completely. In a large bowl combine the cream cheese, canned pumpkin, granulated sugar, large eggs,vanilla extract, ground cinnamon, and pumpkin pie spice. Beat at medium speed for about 2 minutes or until smooth. Pour mixture over the cooled crust then bake for 30-35 minutes. Let sit until completely cooled. In a large bowl beat cream cheese and butter together with mixer until completely smooth. Add in salt and vanilla extract. Slowly add in powdered sugar and beat until smooth and creamy. 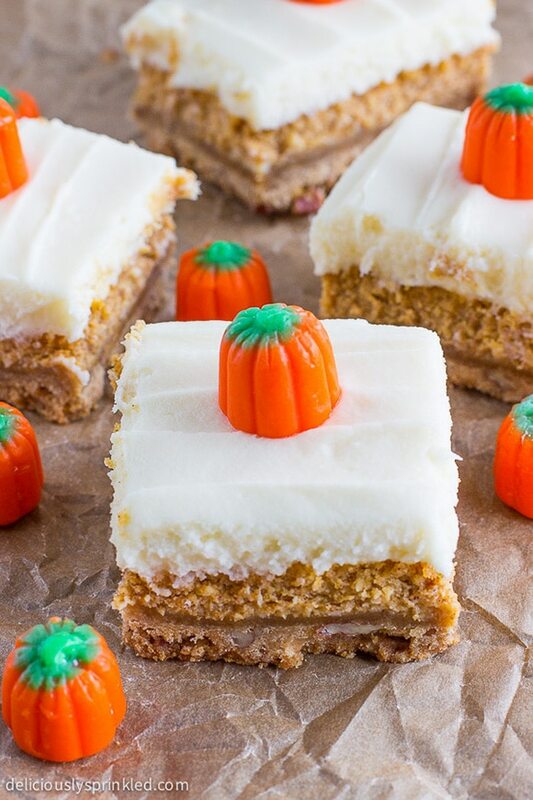 Spread over pumpkin cheesecake bars and refrigerate for at least an hour before serving. Cut into squares then top with pumpkin candy and chopped pecans. Check out for the recipe with pictures here. Combine vegetable stock, garlic, carrot, apple, butternut squash, sage, onion, salt, pepper, cayenne, cinnamon and nutmeg in a slow cooker. Cook for 6-8 hours on low, or 3-4 hours on high. Make sure squash is completely tender and mashes easily with a fork. Stir in coconut milk. Using blender or immersion blender and blend until completely smooth. Add more salt, pepper or cayenne to taste. Serve warm. Check out the recipe with pictures here. In a pot over medium heat, melt butter and sauté scallions. Add in cheese, milk and cornstarch, and mix until melted and smooth. Finally add green chiles and mix until combined. Draw eyes and carve a sad mouth on a small pumpkin. Hollow out the inside and insert a bowl. Pour queso in the bowl and top with chopped tomatoes. Spoon guacamole coming out of the pumpkin’s mouth. Serve with chips! Check out a video of the recipe featured on Tasty Food. 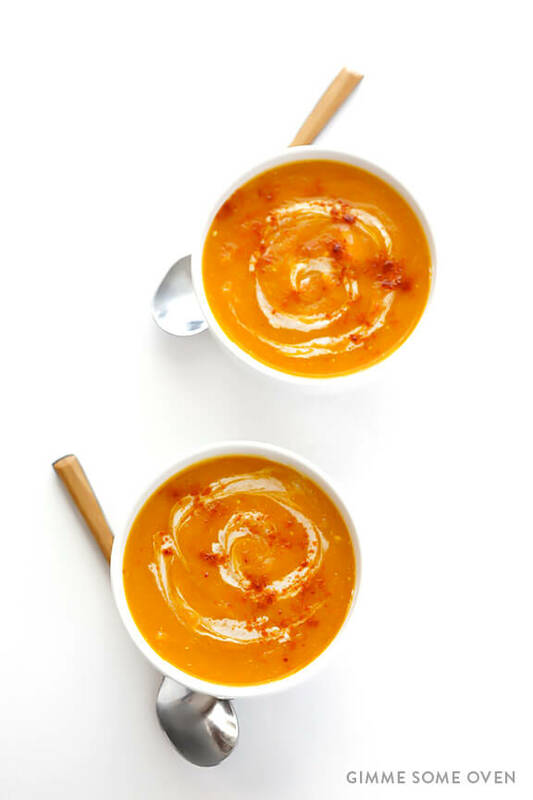 We hope you enjoyed these fun fall recipes! Thinking about beginning a RV adventure this fall? Let Sonny’s RVs help! We have a variety of new and used RVs to choose from! We carry RVs from great brands such as Forest River, Keystone, Jayco, and Dutchmen. Already have a RV? Sonny’s RV can service it! Give us a call at 307-237-5000 or stop by our location at 5000 E. Yellowstone Highway and let us show you why shopping with us can make all the difference.